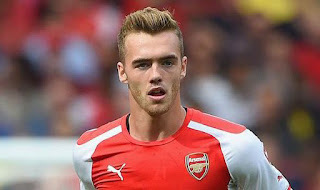 Arsenal have been charged by the Football Association for breaching the Football Agents Regulations over the transfer of Calum Chambers from Southampton. Chambers moved to the Emirates Stadium last summer in a deal worth in the region of £16million. “The charge is in relation to the transfer of Calum Chambers from Southampton to Arsenal on 26 July 2014,” a statement from the FA read. “Authorised agent Alan Middleton has also been charged for allegedly breaching The FA’s Football Agents Regulations in relation to the same transfer. “Mr Middleton has until 17 June 2015 to respond to the charge. Arsenal responded by releasing the following statement: “We have acted in good faith throughout with regard to this transfer.